User-friendly, class tested and authoritatively research-based, Step by Step to College and Career Success offers students proven information and straightforward strategies that they can apply toward their success. 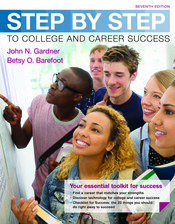 This is the briefest title in the Gardner family of books, and the authors have focused on the most crucial skills and the most important choices students make in order to succeed in college and beyond. The seventh edition covers pressing topics that affect students’ lives and how they learn, expanding on the book's themes of motivation, persistence, resilience, and decision-making. Each new copy of the text can be packaged with LaunchPad for College Success, our online course space that includes videos, the LearningCurve adaptive, online assessment tool, and more. A full package of instructional support materials provides instructors all the tools they will need to engage students in this course and increase student retention. Also available: ACES, a nationally norm-referenced student self-assessment of non-cognitive and cognitive skills.